When purchasing flooring adhesives, the main products on the market are either wet glues or dry adhesives like Lok-Lift. Each type has its own advantages, depending on your needs and budget. First, let’s discuss the difference in cost between wet glue and dry adhesives. While the cost of adhesive will vary depending on the size of your project, there are industry standards of pricing for both wet glues and dry adhesives. A wet glue offers your lowest price point, which is why it’s often the go-to product for people whose highest priority is maintaining a low cost only. When purchasing wet glue, you can expect to pay roughly between $0.08-$0.09 per square foot. The cost of a dry adhesive like Lok-Lift will vary depending on the size roll you purchase, but it typically costs $0.33 per square foot. While there is a noticeable price difference if you focus on the per square foot price, there is a noticable increase in value depending on your needs. When evaluating overall cost, it’s important to also consider total amount of time you have to complete an installation. Wet glue, for example, offers relatively low initial costs, but requires longer setup and curing times, so it’s not ideal for projects when your customers can’t afford downtime. Not only that, but wet glue often comes with odors which are not ideal in settings where people will be walking. On the other hand, a dry adhesive like Lok-Lift doesn’t require any time for setup and allows for immediate foot traffic post-installation significantly cutting project time. It also does not bring with it any fumes. Another scenario we encounter often is when a customer has flooring that was laid over asbestos. If they need to put in new flooring, these customers have two options - they go through an expensive abatement process in order to remove it, or they can decide to go over the flooring without removing. In the latter scenario, a dry adhesive like Lok-Lift solves the problem because it can secure a new layer of flooring over the old, allowing the customer to avoid tearing out the old floor. Which Flooring Option is Best? 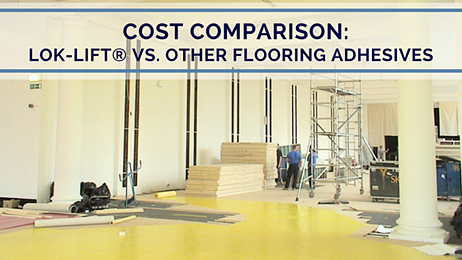 It’s important to look at your flooring project as a whole to decide which adhesive is best. Wet glues are typically best for projects where a low cost is the highest priority. Wet glue can also be useful when a quick turnaround time is not essential since you shouldn’t walk on a new floor set with wet glue for 24 hours. If you are in a situation where you can’t afford downtime or don’t want to risk harmful odors, like an installation at a hospital or school, I recommend a dry adhesive. This will allow for installation to occur overnight and then business as usual may resume the next morning. While it often costs more to use a dry adhesive, there are specific projects where it offers tremendous value to the customer because of its quick turnaround time and minimal environmental impact.